More work from the life room. I've been working on tone a fair bit (which is why there are slabs of value included at the bottom here [this is a page from the MA journal from my current studies]). For those interested in this sort of thing - I thoroughly recommend 'The Artists Guide to Figure Drawing' by Anthony Ryder. 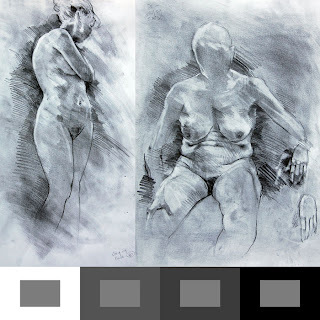 It's not particularly strong in terms of experimental exploration, but he brings a lot to the party in terms of an 'American academic approach to representational observational figure drawing' (try saying that after a bottle of pinot). Also included as few pics from A5(ish) sketchbook. I've been battering my self confidence with biro (ballpoint pen) drawing off and on for a while now. 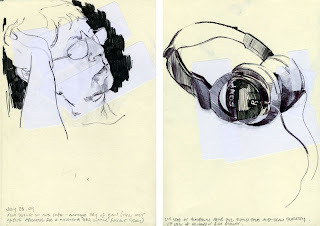 The other day my better half moved the headphones I was drawing in a bid to tidy the house whilst the nipper was sleeping. I hadn't finished (much to her hilarity) - and couldn't get them set up again 'just so' (again - further hilarity). Not to be beaten (biro is an unforgiving enough medium as it is) I plastered some of the page up with address stickers to start half over again. Revelation! I'm diggin the translucent obscuring effect these stickers have over black ballpoint. There's now a wad in the back of my sketchbook just singin to be used to layer up subsequent drawings! Of course - it's only a matter of time before they go 'Karabekian', the glue toxically degrades and they go a brittle yellow before dropping off the page (queue more hilarity from certain quarters of the Robinson household).